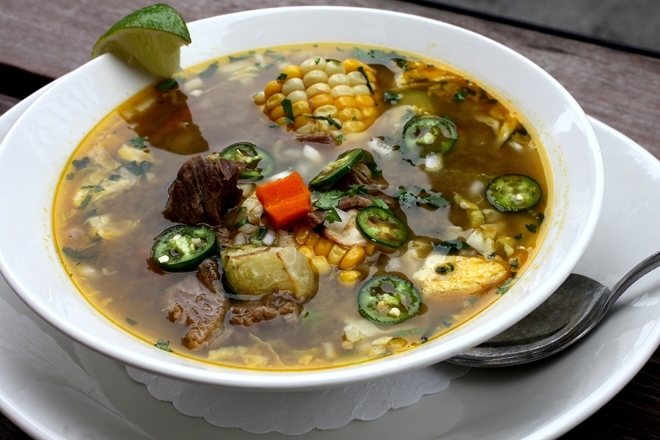 Green Chile Beef Caldo: Chef Alonso's family recipe for Caldo de Res. 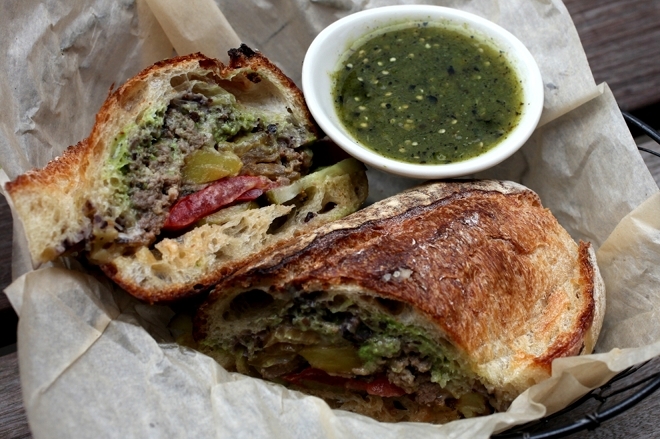 Steak and Potato Torta: Chef Will's take on a torta de hamburguesa. The Xoco chefs delivered deliciousness beyond my expectations on their latest seasonal menu: Mexican Tradition, Midwestern Bounty. The theme this month is closely related to the work we do all year at Xoco: the magical act of honoring the deep traditions of Mexican cooking while allowing nontraditional native Midwest ingredients to shine. Here, at the end of the summer, we have the bounty of many exceptional ingredients to work with. The Green Chile Beef Caldo is Chef Alonso’s family recipe for Caldo de Res. There is no better flavor for when a hint of autumn sends a chill up your spine. One of our longtime regulars, Richard Stracke, said the broth only gets more flavorful as it is eaten. After the sweet corn on the cob, locally grown skin-on chayote, earthy carrots, and slow-roasted chuck roast are long gone, the essence lingers on in the broth. Chef Will, an alumni of Bill Kim’s celebrated restaurants, brings a dynamic range of flavor to the new Steak and Potato Torta. Beef tenderloin, new potato, and jack cheese are cooked together in the wood-burning oven. These rich, savory flavors are elevated with the juicy brightness of Xoco’s rooftop tomatoes, the sweet and sour tang of housemade pickles, and a spicy herby mayo. Chef Will’s take on a torta de hamburguesa, the Steak and Potato Torta, has become my mealtime obsession. Chef Rick and Deann’s garden continues to yield tasty greens, thanks to in-house green thumb Bill Shores. Dressed in a spicy tomatillo vinaigrette, Bayless Garden greens are the base of our new salad. Gunthorp Farm’s organically raised chicken breast is grilled next door at Frontera: we top that with a cauliflower, corn and tomato salsa. Each bite of our new Spicy Grilled Chicken Salad has a touch of smoke, the kick of chile, and the crisp, delicious interplay of late summer vegetables. 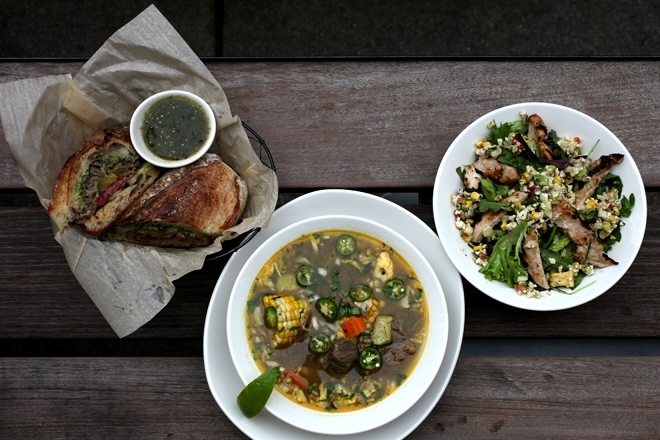 The Mexican Tradition, Midwestern Bounty menu is available only at Xoco River North until October 1st. PS- we also brought back the bacon streusel topping for our soft-serve ice cream. See you soon! 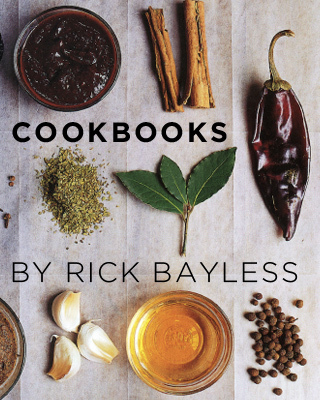 Could I please get your recipes? They look so good! Well, I forget to mention the ones from Oaxaca, Mexico. The one with the omelette red chili de arbol sausage in it. Also the fishe recipe that you make in a grill basket with adobo. I would really appreciate it!!! Hi Debbie! We share a lot of recipes on the website, but we don’t always share what we make in the restaurants. We’ve gotta keep *some* secrets, right?